Because Our Candles are Hand-Crafted, They are NOT Perfectly Formed like a Machine-Made Product. Each Aura Petite has its own character utilizing the best-quality soda glass. They are designed to be attractive, functional and sturdy. Diameter at Largest Point is 2-1/4 Inches. The Height is about 2-3/4 Inches. The 2.6mm cotton wick extends close to the bottom of the candle. Burn Time: Approx. 6 Hours per Ounce of Firefly Paraffin Lamp Oil. Results May Vary. The Aura Petite uses a Firefly 2.6mm Wick (included). Replacement wicks are available at Amazon. The Liquid Candle Holds Approximately 2-3/4 Ounces of Lamp Oil. The Lamp Oil is NOT included but is sold on Amazon. Just Search for Firefly Lamp Oil. A Small Plastic Funnel is Included for Easy Refilling. 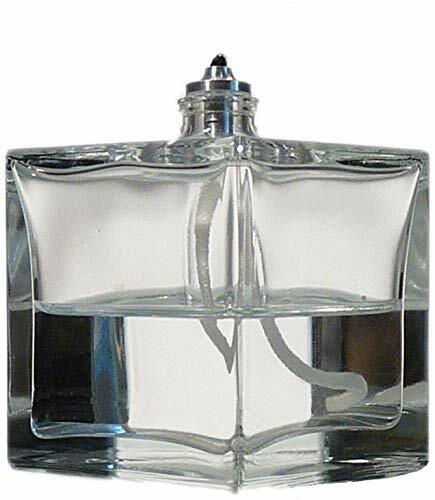 Firefly Modern Transcend Clear Glass Oil Lamp is a Unique Gift for Women and Men. The Bliss Oil Candle Appears to be Floating in The Hurricane Candle Holder.